One of my favorite scientific method activities was a project that used a flash simulation to investigate cricket chirps and how the frequency is affected by temperature, humidity and wind speed. Unfortunately, flash is no longer supported by modern browsers. 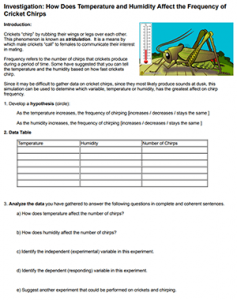 This alternative assignment asks students to listen (and count) cricket chirps, create a data table, and determine which factors, temperature or humidity, have the greatest affect on frequency of chirps. Students can do this at home or in the computer lab, provided they have headphones. You could also do this in class and have the students listen quietly and count the chirps. They develop a hypothesis, construct data tables, and answer analysis question on their own paper. I do have a handout that could also be provided which contains a data table already made. Disclaimer: Though it is well documented that crickets do change frequencies based on the temperature, I made the videos with animatron and did not follow the formula provided by the Farmer’s Almanac. It might be an interesting follow-up to share this formula and ask students how this experiment could actually be performed with real crickets.